Yes, if the chat is lagging, it sometimes doesn't show guilds as well. They had some issues. Dont mind, just seems to be lagging. There seems to be a bug after the maintenance. I tried to find you ingame but I had no success. back again. I would like to rejoin you and to enjoy the lovely chats again. Stared playing ESO again. I'd love an invite if there are any free slots available. was wondering if i can get an invite into the guild? Brings a tear to my eye to know fishing event is still a thing. Oh ye olden days. I've sent you an invite to Redfur Exchange! Heya , I've been away for a while. Could I get a reinvite please ? Hi. I've been away from the game for a while. Could I please get a reinvite? Hi. I am a returning player and I would like to rejoin the Redfur guild. I haven't been playing for more than 1 year and I got kicked out. Sorry for the late response; I've just sent you an invite to RE. WEAVER why have you deserted me!! Sent an invite! Welcome back! Hey all, i'm back, can i get a reinvite to the guild? Hey! Will invite you if that is your ingame name too! Hi, how are you all? Still got a spot in the guild? Where can i see my in game name? hey tanatos, please mail me your ingame username so i can reinvite! Summerset is upon us! And EU servers crashed! I want to join the guilt again! who can i message? hey sure, is that your ingame name? hey guys, came back to the game some weeks ago and wondered if i could get invited back to the guild? 2 days left to join our army of Naked Chefs! Should work now, GmCiccio, you can try again! Redfur is here to help! for EVERY Crafted Set Station in the Game! The Redfur Guilds were founded by Zlater shortly after the release of the Elder Scrolls Online. Currently, we have two Social/Trading Guilds in our family, Redfur Trading and Redfur Exchange who both try to help their members and foster a friendly environment for those members for socialising and trading! Both Redfur Guilds are now led by different people but Redfur is and will always be one family! "If you're here it means you've found us through one of our awesome guilds! More than anything though what it means is that you're a friend, and we are really glad you could join us :D"
Talk and chatter amongst guild members is to remain polite, clean, non-discriminatory and fair. Be considerate of others, put yourself in their shoes before you say or do something. The guild bank is there as a courtesy, if you take from the bank, please try your best to replace an equal value of items. Otherwise others will stop putting things in there for next time. We are also a Trading Guild so we anticipate that people will use our Trader to sell their goods and not bypass him by trying to sell in Guild Chat - but, of course, we will often offer services or goods in Guild Chat at a Guild Discount - thereby benefitting our Guildies, not ourselves. 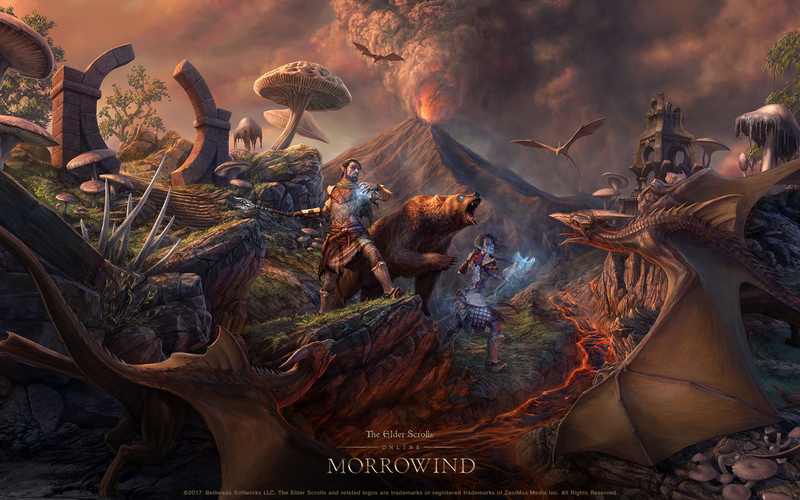 A new chapter is upon us as ZOS releases their first new Chapter named Morrowind. With this new content we will have access to Vvardenfell as a new zone, a new class (Warden) and a new PvP mode (Battleground). With this new content we expect a lot of new players to enter ESO for the first time, but also a lot of old players to return to Tamriel. Redfur is here to welcome both with open arms! We look forward to seeing everyone's new Wardens and how it will affect ESO in the future! With Homestead already here for a few months we have managed to create a Guild Hall for Redfur that aims to help all our Guild Members! The Guild Hall is StuWade's primary residence (donated generously to that purpose). We have recently completed a project to fill our Hall with Crafted Set stations in order to benefit all our members. The project has, with the help of everyone in the Guild (and our Affiliates) donating Master Writs, now populated Redfur Hall Crafting Centre with every Crafted Set in the game! Don't forget though that the Guild Hall has more than set stations. It has a duelling arena, a bar (!) and even a skooma corner! Visit today to socialise and have fun! If you want to check out some quick guides then visit our Furniture Crafting and Crafting writs threads or check out our sections for Guides, Events, which you can also list on our Calendar, a space on which to post your Trade or Crafting requests, a Creative Corner and a Gallery for posting your pictures. Check out the Guide section to find tips on where to find all the new sets and Undaunted Monster Helms that have been introduced with One Tamriel. And don't forget we offer various opportunites as well. Have a look at our Fish for a Guild Trader, it's just one of our stickied Crafting/Trading-guides to improve your trading experience and under our events lists you can sign up for Trials as well!